There’s no shortage of tech specs, design notes, and analysis that we could include about every mattress we review. But sometimes just knowing the basics are enough to know if it’s the right mattress for you. 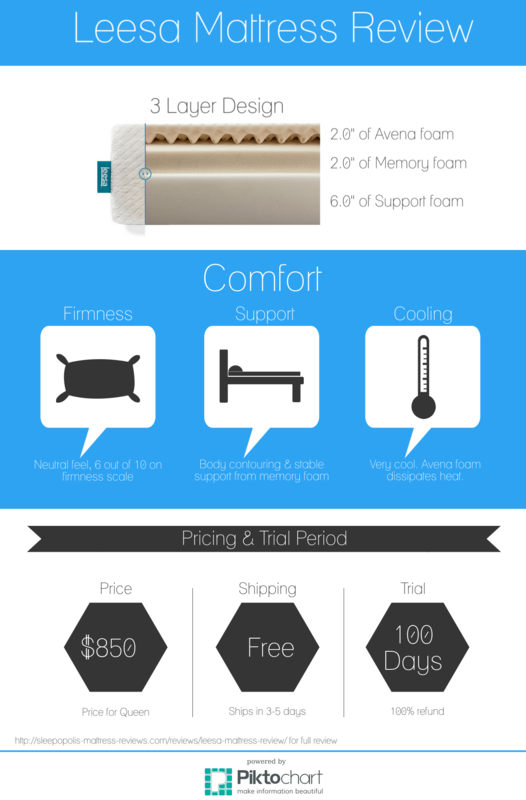 Check out our Leesa mattress review infographic below. This infographic hits all of the key design, functionality, and pricing attributes of Leesa Sleep, one of the most popular and fastest growing online mattresses. If you’re intrigued by our infographic summary stop by and give our complete Leesa mattress review a read. The middle layer is 2.0″ of Memory foam. The memory foam is the support layer. It provides great body contouring and pressure relief, allowing consistent blood flood and minimizing your need to toss and turn during the night. The bottom layer is 6.0″ of Support foam. The support foam acts as a strong foundation for the other foams to rest upon and gives the mattress shape. Firmness – the Leesa sits at a 6 out of 10 on the firmness scale. It has a fairly neutral feel. The Leesa was designed to be a balanced firmness so that it meets the needs of most sleepers. Support – the combination of the Avena foam and memory foam create a strong team of both support and comfort. As mentioned above, the memory foam provides great pressure relief from top to bottom. Cooling – the layer of Avena foam (a latex foam alternative) allows for breathability and minimizes heat build up, allowing the mattress to sleep cool during the night. Shipping is free and comes in 3-5 days. The mattress is shipped compressed in a large box. Once it arrives you simply cut it loose from its box and plastic bindings. It will take the mattress several hours to decompress. The trial period is one of the best available. You have 100 days to sleep on the Leesa. If for whatever reason you don’t enjoy your sleep experience you can request a refund at any time during the trial period. Still need more info? Give our full Leesa mattress review a read here. If you think the Leesa is right for you make sure to use our $75 instant discount promo code here. Unless you are absolutely in love with your sheets I think you’d probably be better off just getting a new set of sheets that fits better. A quality solid foam topper isn’t super cheap. eLuxury’s 100% latex topper is one of the best values for the level of quality / performance available in my opinion. http://www.eluxurysupply.com/products/100-natural-latex-mattress-topper?variant=1451552580 (you can get an extra 15% off with code SLEEPOPOLIS). I’m afraid if you get a cheaper topper than that you’ll be doing the Leesa and yourself a disservice, as it will most likely negatively impact the performance of the Leesa for you.